Are bats using your bat box? 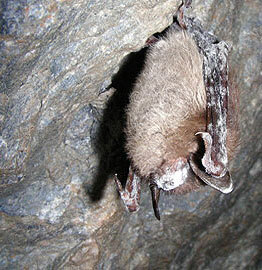 White-nose syndrome (WNS) is a disease that is killing hibernating bats in North America. It is caused by a fungal infection of the skin, primarily around the muzzle, ears, and wings. Once a bat is infected, it tends to arouse from hibernation more frequently. It may be disoriented and uses up its fat stores. The deterioration of wing tissue can impair the bats’ ability to fly. Dehydration and starvation often lead to death. The fungus that causes WNS, Pseudogymnoascus destructans (Pd), was first discovered in North America in 2006 in NY. It has since spread into 33 states and 7 Canadian provinces (as of Sept 2018). This fungus thrives in the cool, humid conditions found in mines and caves. Some bat species are being particularly hard hit, with 70-90% of a hibernaculum population killed by the disease. There is currently no known cure. 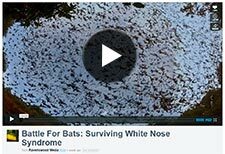 White-nose Syndrome is not a direct threat to humans. No other mammals seem to be affected. WNS can be spread from bat to bat and from the cave environment. Equipment and clothing can also carry the fungal spores that cause WNS from site to site. WNS was first detected in SC in March of 2013 at Table Rock State Park. Since that first occurrence in Pickens County, the fungus has been detected in 9 additional counties. South Carolina Department of Natural Resources staff conduct testing for Pd and WNS in caves and mines that are known to be home to hibernating bats. Testing is conducted in late winter (February and March), when symptoms of disease are more likely. Samples are sent to the National Wildlife Health Center and Southeastern Cooperative Wildlife Disease Study for diagnosis. Unfortunately, tri-colored bat populations in major Upstate hibernacula have declined at an alarming rate (up to 97 percent) since WNS arrived in South Carolina. After a total decline of 91 percent at one major site after only three years, the most recent count shows a slowdown in the decline. But it doesn’t leave much: only 30 bats where once there were hundreds. On a more positive note, while the testing conducted in Piedmont sites in 2017 and 2018 came back positive for the fungus, Pd, on bats or in the cave environment, none of the bats had any obvious signs of disease (WNS). South Carolina's warmer, shorter winters mean bats spend less time in their hibernacula, the environment that favors the fungus. Not all colonial bats species are affected by WNS. The non-hibernating evening bats may not be impacted at all. Brazilian free-tailed, Rafinesque’s big-eared, and tree bats don’t seem to suffer from WNS, but the fungus that causes the disease has been found on them. Current WNS positive counties in South Carolina include Oconee, Pickens and Richland. Current WNS suspect counties include Cherokee, Greenville, Lancaster, Laurens, Spartanburg, Union, and York. While dark gray counties had Pd negative results, not all potential sites within those counties have been tested. Also, the lack of a positive Pd result does not definitively indicate the absence of the organism. ** WNS has been detected on these species, but have not yet shown diagnostic sign of the disease. See the South Carolina White-nose Syndrome Response Plan - Revised April 2019 (PDF) for more information. What should I do if I find dead bats? Wildlife professionals need to be prepared for bat die-offs and groups of bats displaying unusual behaviors. Typically, testing for WNS is only done in the cooler months of February and March, when the fungus is most easily detected. South Carolina Department of Natural Resources staff will submit appropriate bat samples to the National Wildlife Health Center and Southeastern Cooperative Wildlife Disease Study for diagnosis. While there currently is no proven cure or prevention of WNS, it is important to properly diagnose it and to monitor WNS-positive colonies. While more than 90 percent mortality has been reported in Northeastern bat populations, South Carolina's warmer, shorter winters may favor improved bat survivorship. In winter and early spring, if dead and dying bats are found with white fuzzy material on muzzle or wings or in groups of six or more bats, contact your regional wildlife office promptly. Keep children and pets away from any dead or dying bats and place a bucket or can over any fresh carcass. If bats are not fresh (odorous or have ants) they cannot be tested and should be disposed up by scooping them up with a shovel and placing in a plastic bag, tie off the bag and place bat(s) in the trash. Bats flying in daytime during hot weather are not too uncommon and that behavior is probably not linked to WNS. WNS testing is not done in the warm months. Wildlife professionals that plan to submit bats for testing should store the bat on ice or freezer pack or refrigerate. Bat should be double bagged in sealable plastic bags (Ziploc) prior to storage, labeled with date, specific location and contact information and placed on ice (not frozen). If one to three dead bats are found at any time of year outside, then dispose of carcass. No submissions are accepted on Friday through Sunday (the testing lab isn't staffed over the weekend). Never handle a dead or live bat with bare hands. Dead bats are best picked up when wearing disposable latex or nitrile gloves, then double bag the bat in plastic bag. To determine the best plan of action for dead bats, follow the flowchart in Figure 2 in the SC WNS Response Plan above. See page 9 for more detailed information on how to deal with bat carcasses. Downloadable files below are in the PDF format.